A local company, Home Instead, specialising in care of older people enjoyed a momentous day on 20 January when its brand became the first ever national homecare provider to be presented with a Queen’s Award for Enterprise: Innovation. The prestigious Queen’s Award for Enterprise: Innovation was presented to Home Instead Senior Care by Her Majesty’s representative for Cheshire, the Lord Lieutenant David Briggs, MBE, KStJ, at an official ceremony. The Queen’s Awards have been running for over 50 years and are the highest accolades available to UK businesses. Home Instead Senior Care is the first provider of its kind to receive this award due to the very different model of companionship-based high quality care that they brought to the UK care sector in 2005. The company has an office based in Wimborne which provides care for clients across East Dorset and Blandford and delivers care and companionship to people in their own homes. Clients and caregivers joined representatives from the company’s 180-office strong network and the National Office support team, to mark the memorable occasion. 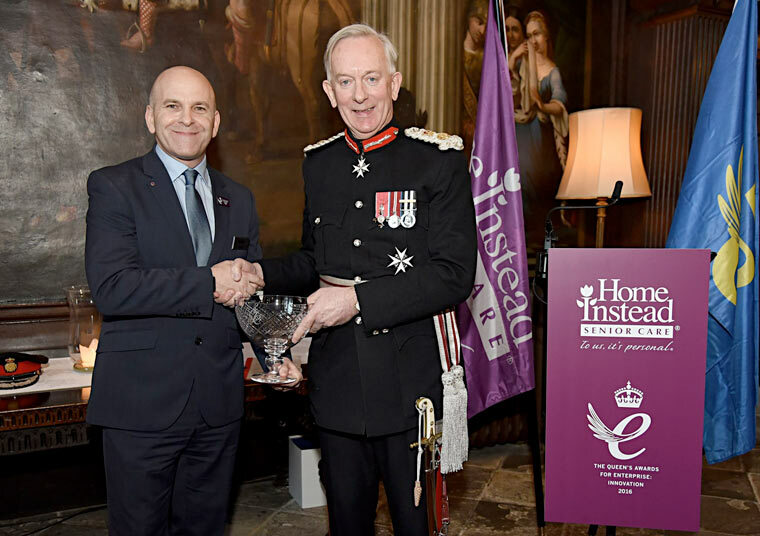 Home Instead’s UK Managing Director Martin Jones received the royal recognition on the brand’s behalf with an historic scroll and commemorative crystal bowl. He said: “We are the first and only homecare brand ever to have received a Queen’s Award for Enterprise. To receive the award for innovation is, I think, a real reflection of the truly pioneering approach we have taken to providing care for older people in the UK. The royal achievement has also been recognised by Andrea Sutcliffe, the Care Quality Commission’s Chief Inspector of Adult Social Care.